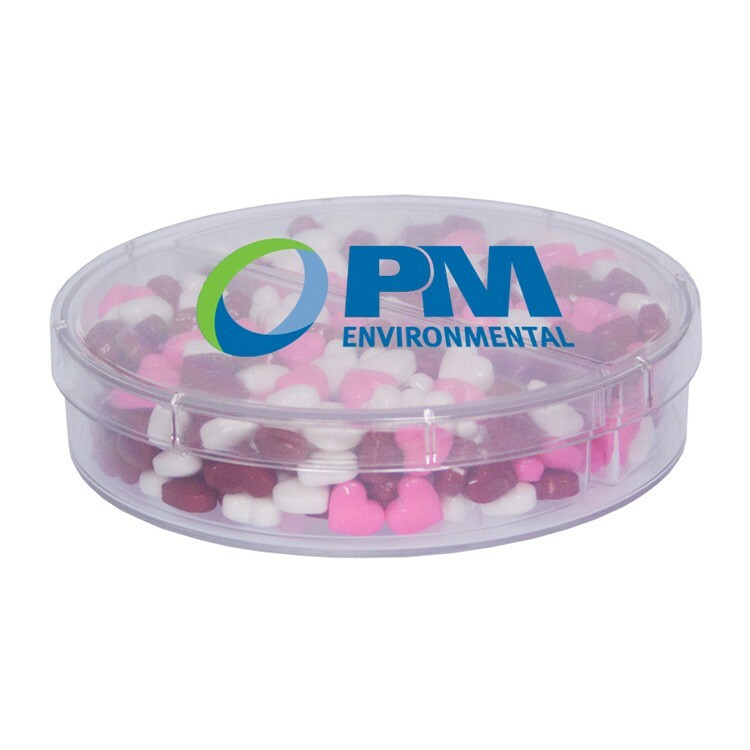 20-25 Signature Peppermints in a recloseable box with 4-color process printing on five sides. 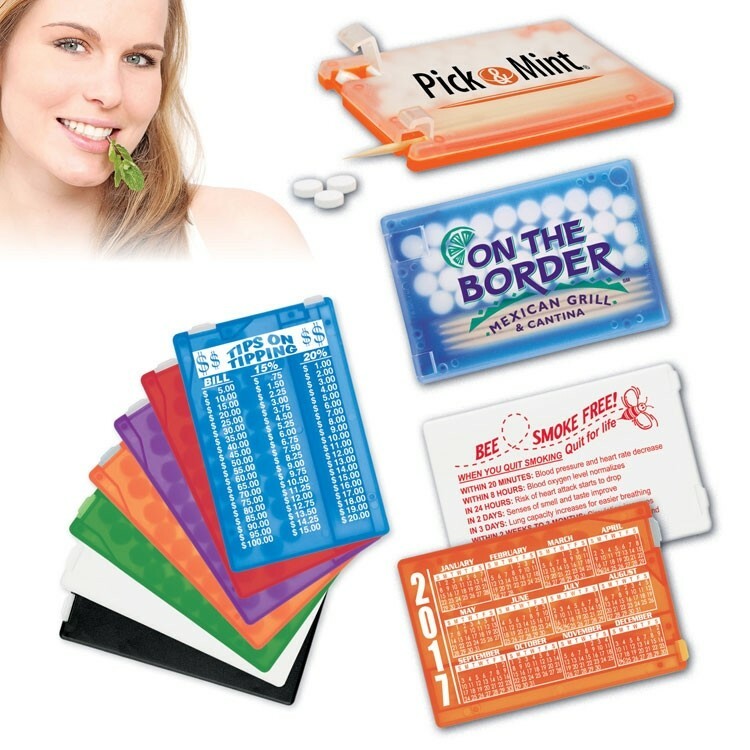 Great for tradeshows, sales person leave-behinds, new product intros, coupons, scratch-off promotions, or business cards. Tin options available. 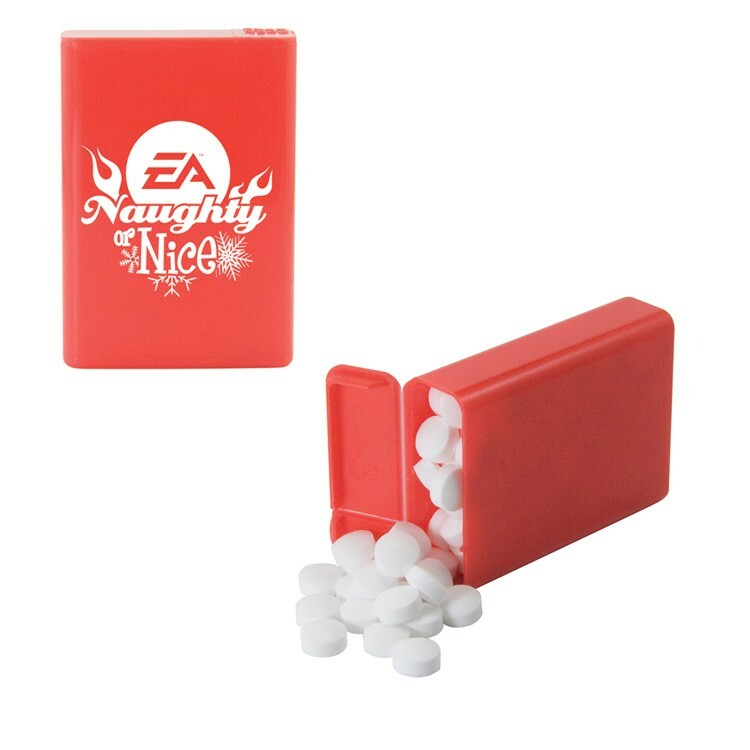 Can be filled with: Signature Peppermints, Red Hots, Spearmints, Gum, Chocolate Littles, Sugar Free Mints, Stars, Hearts, Mini Tarts, Colored Candy, Sugar Free Gum. Great environmentally friendly product. EQP is only valid on increments of 2500. 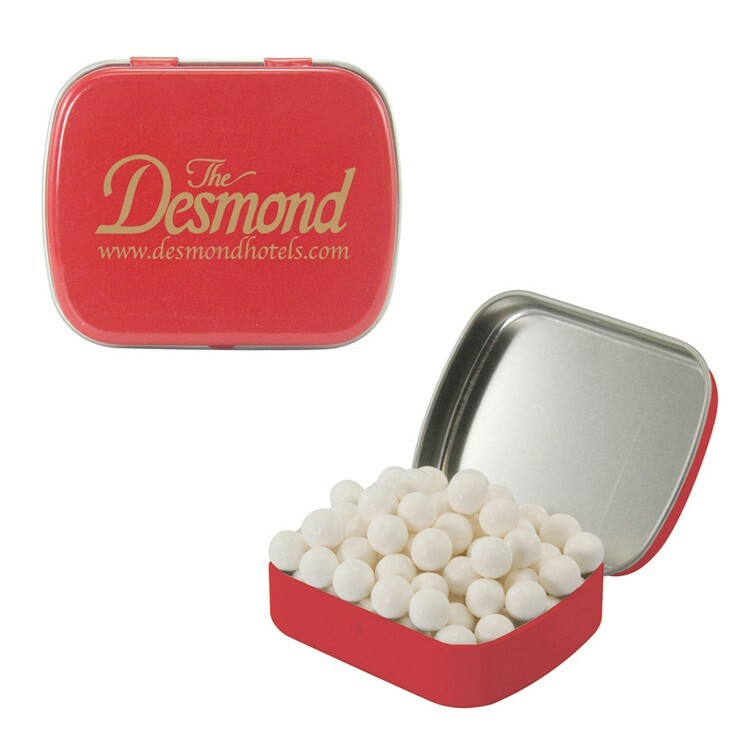 Filled with Signature Peppermints, this upscale hinged tin is printed with either a high gloss laminated four color process label with full bleed or one color direct imprint. Magazine quality printing makes a gorgeous presentation. Tins can be filled with signature peppermints, candy cinnamon red hots, jelly beans, chicklet gum, chocolate littles (m&m type), hearts, stars, colored candy, sugar free gum, or sugar free peppermints. The tin is made in China and the candy is made and filled in the USA. Compare and save. 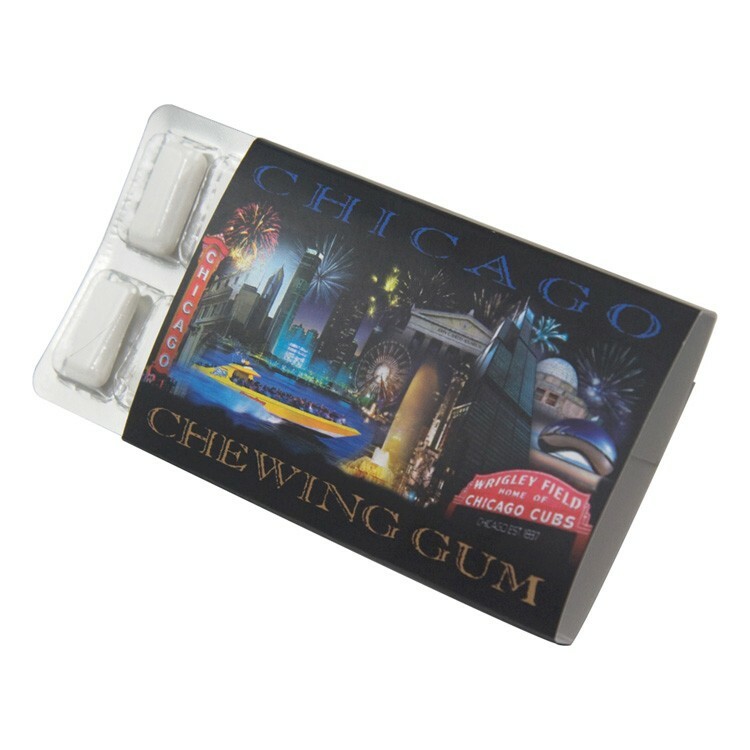 This blister pack comes with 12 pieces of sugar-free peppermint gum, in a sleeve with your artwork printed in four color printing on all sides. A chickle gum treat! 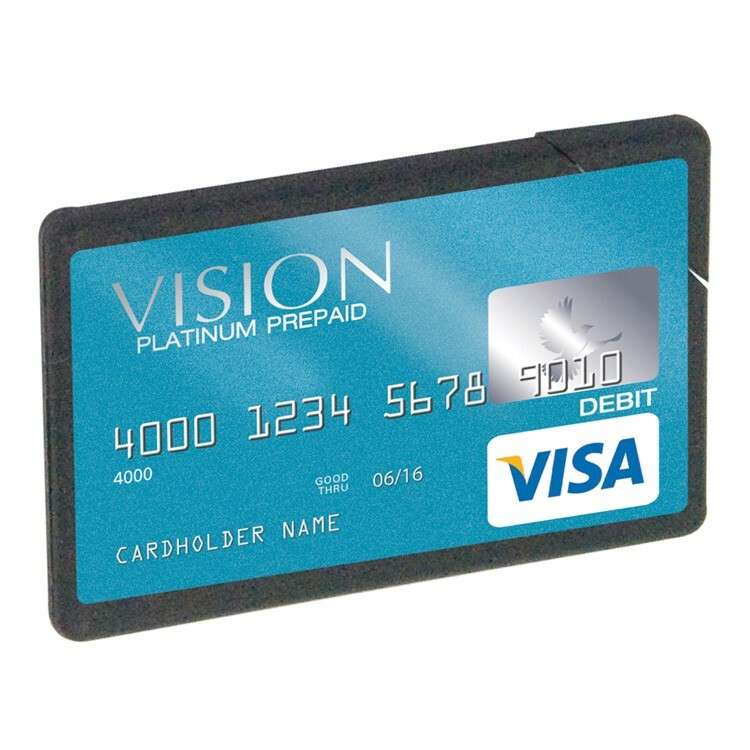 This Plastic Mint Card resembles a credit card and dispenses Sugar-Free Peppermints. Makes the perfect gift and comes in a variety of colors. 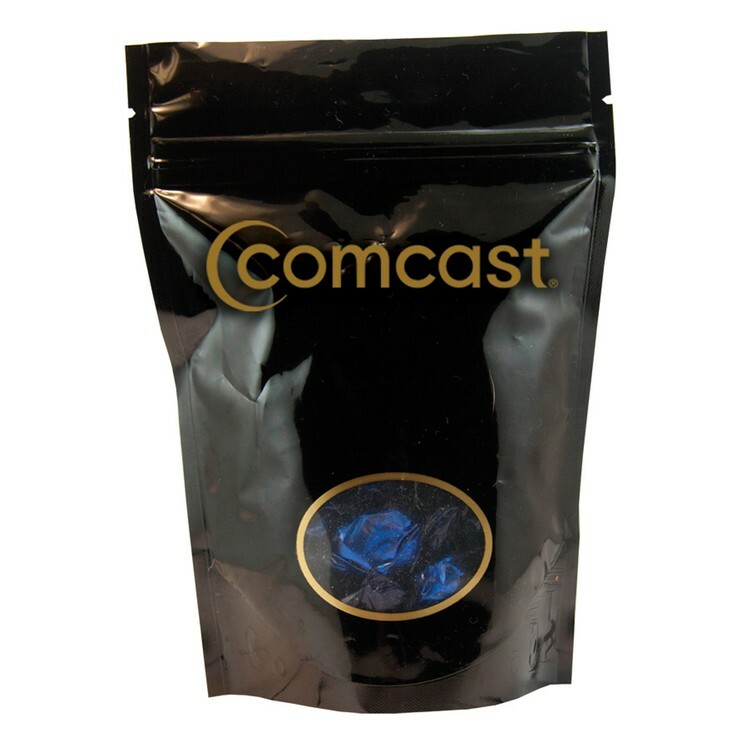 Comes printed with a 4-color process laminated decal or a 1-color direct imprint. This upscale large hinged tin comes printed with a laminated 4-color process decal or a 1-color direct imprint. 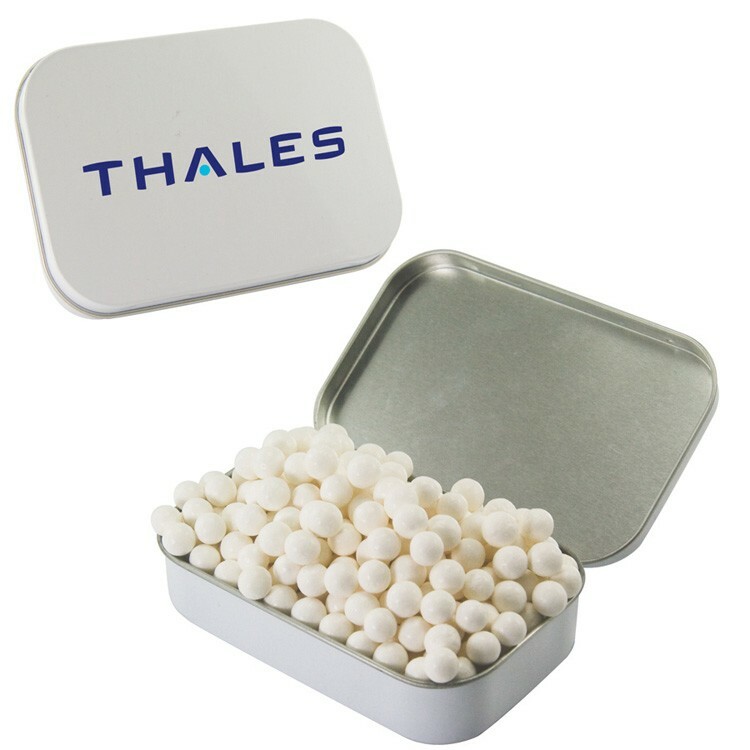 The tin comes in white or silver. 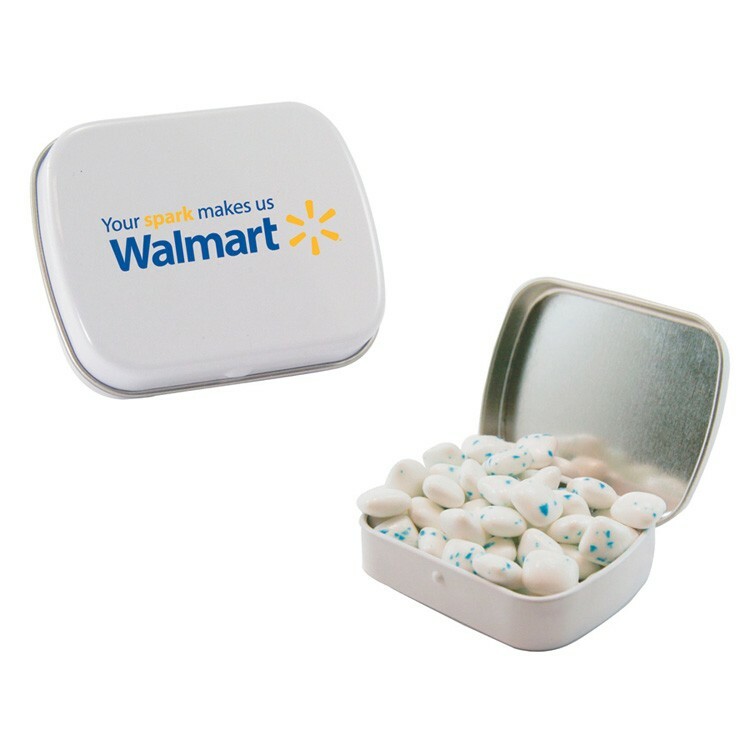 Can be filled with Starlite Mints, Signature Peppermints, Cinnamon Red Hots, Jelly Beans, Gum, Chocolate Littles (M&M-type candy), Colored Candy, Sugar-Free Mints, Candy Hearts, Candy Stars, or Sugar Free Gum. The tin is made in China and the candy is made and filled in the USA. 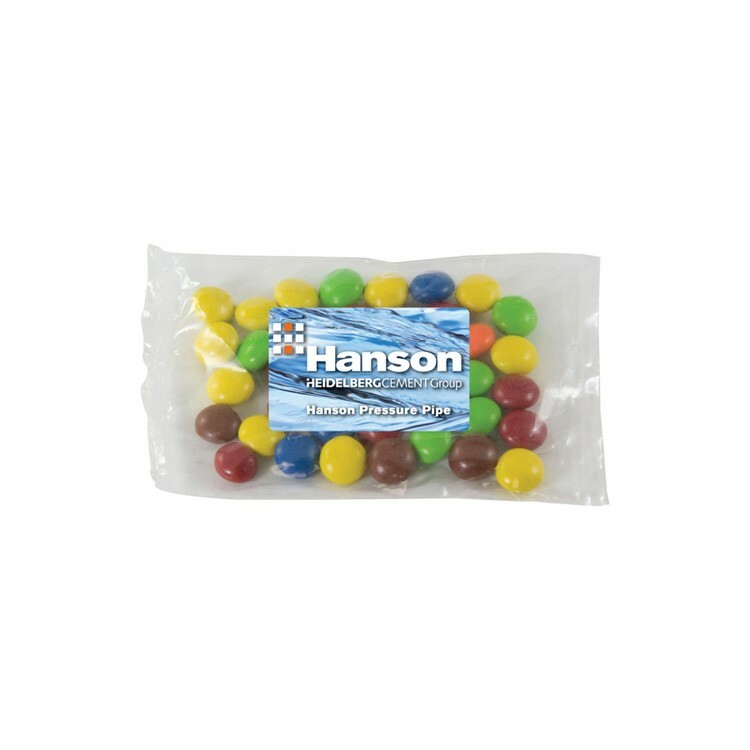 This cellophane bag comes filled with Chocolate Littles (M&M-type candy) and is printed with a 4-color process decal. 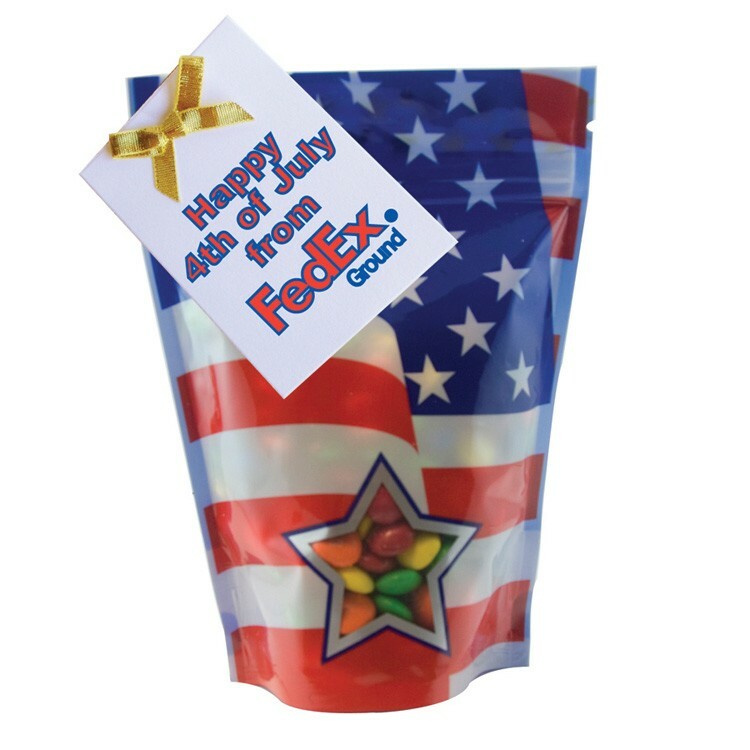 Can be filled with Signature Peppermints, Red Hots, Spearmints, Jelly Beans, Gum, Sunflower Seeds (Roasted & Salted), Hearts, Stars, Sugar Free Gum, Chocolate Littles, Colored Candy, Corporate Color Chocolates, Corporate Color Jelly Beans. 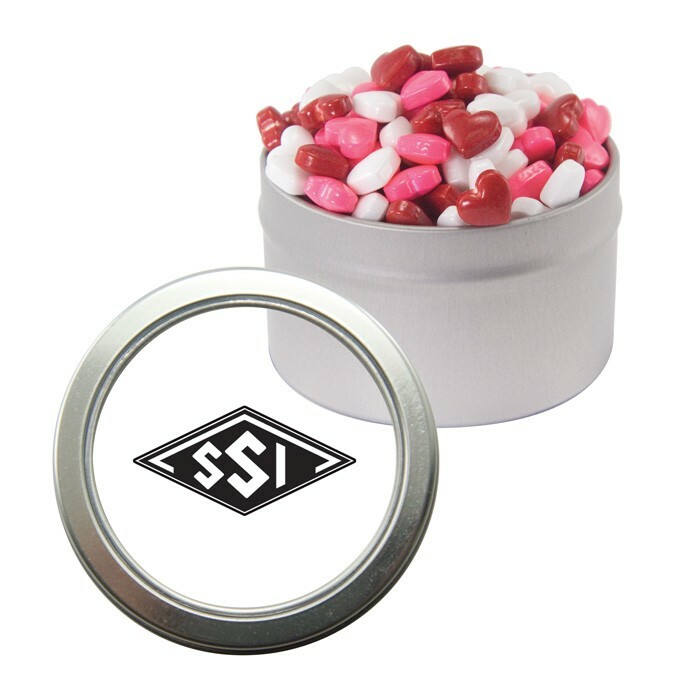 This upscale round Snap-Top Tin comes filled with Signature Peppermints and is printed with a 4-color process laminated decal or a 1-color direct imprint. Other fills include Cinnamon Red Hots, Gum, Chocolate Littles (M&M-type candy), Sugar-Free Mints, Sugar-Free Gum, or Colored Candy. The tin is made in China and the candy is made and filled in the USA. 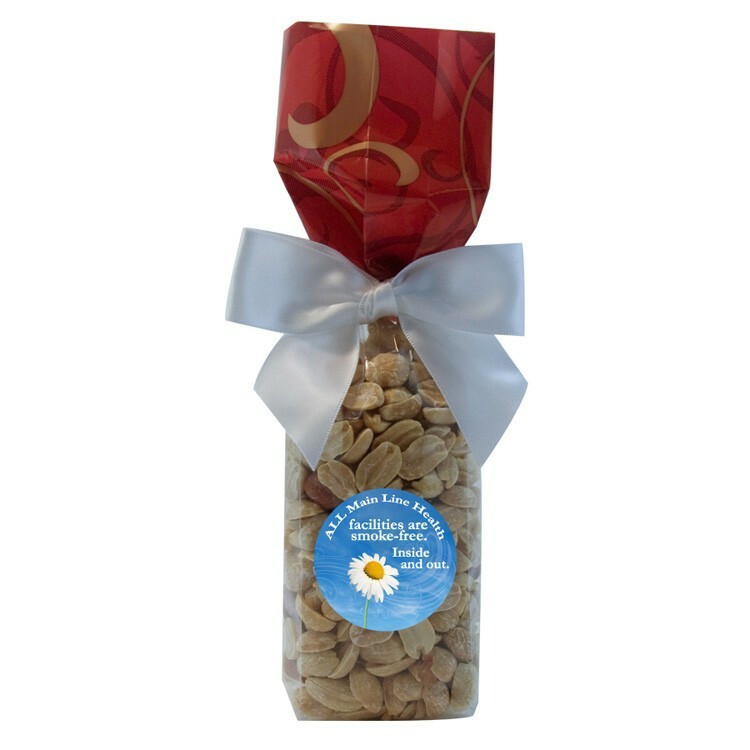 Our wine bottle filled with Signature Peppermints is a fantastic way to say "Thank You”. Each one is hand filled, sealed with an authentic wine band, and printed with a 4-color process laminated decal. 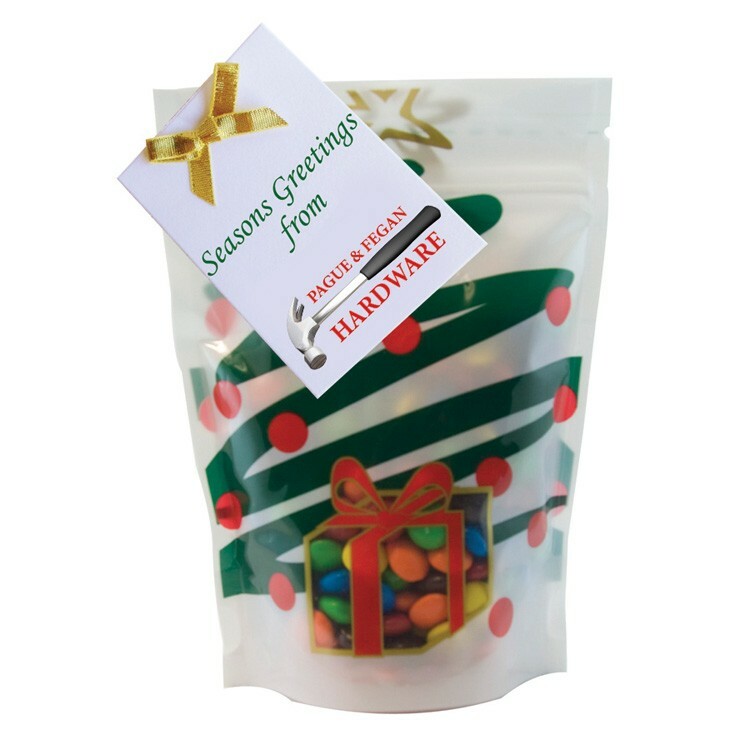 Other fills: Signature Peppermints, Cinnamon Red Hots, Jelly Beans, Gum, Chocolate Littles (M&M-type candy), Corporate Color Chocolates, Corporate Color Jelly Beans. 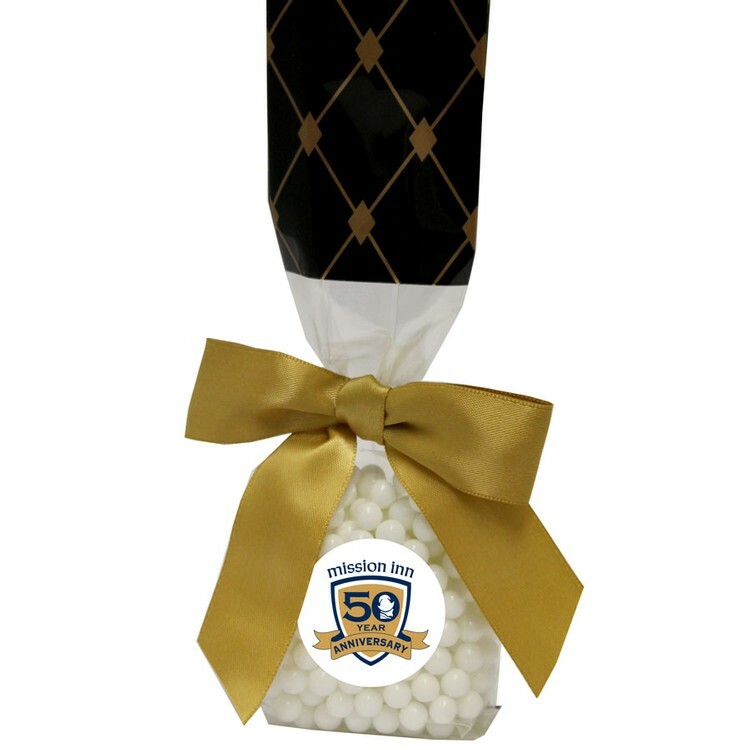 This recloseable window bag is filled with Hard Candy and comes with a 1-color hot stamp of your logo or a full-color gift card with a gold bow. An elegant way to show your clients you care, and perfect for the holiday season. Available in multiple colors and designs. Can be filled with a variety of candy, chocolates, nuts, or pretzels – see pricing. All window bags are hot stamped with Gold or Silver only. This upscale see-through tin comes filled with Candy Hearts, and is printed with a 1-color direct imprint. Can be filled with Signature Peppermints, Gum, Red Hots, Jelly Beans, Peanuts, Jolly Ranchers, Sugar Free Mints, Candy Stars, Candy Hearts, Candy Hearts, Sugar Free Gum, Colored Candy, Chocolate Little, Mini Tarts, Corporate Color Chocolates, Corporate Color Jelly Beans, Chocolate Rocks, Hershey Kisses, Hershey Miniatures, Reese's Cups, Chocolate Espresso Beans, Trail Mix, Chocolate Raisins, and Mint Lentils. The container is made in China and the candy is made and filled in the USA. 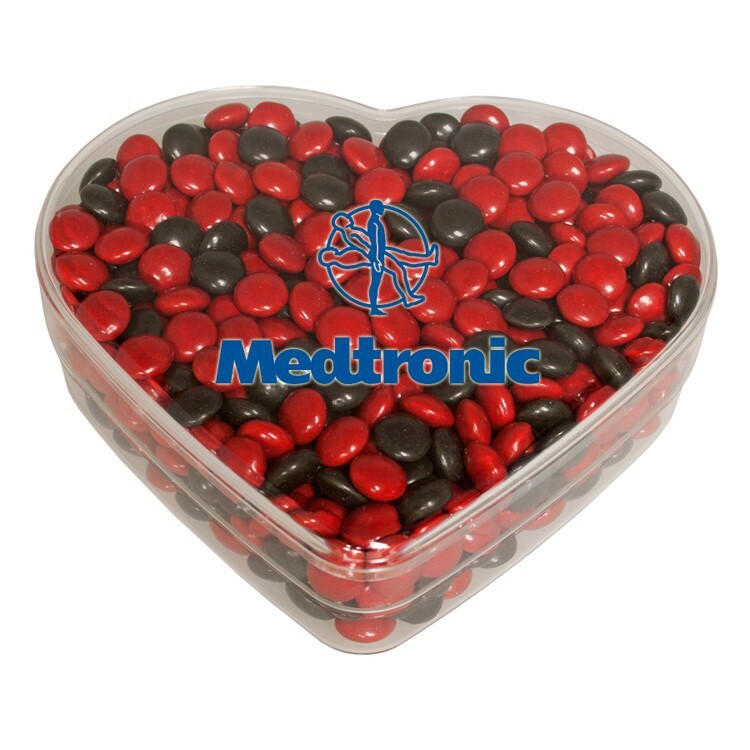 Our clear acrylic heart show piece is filled with corporate color chocolates and is a great way to show your clients why your company is clearly the best. Can be filled with StarLites, Red Hots, LifeSavers, Jelly Beans, Hershey Kisses, Hearts, Colored Candy, Chocolate Almonds, Corporate Color Chocolates, Corporate Color Jelly Beans. 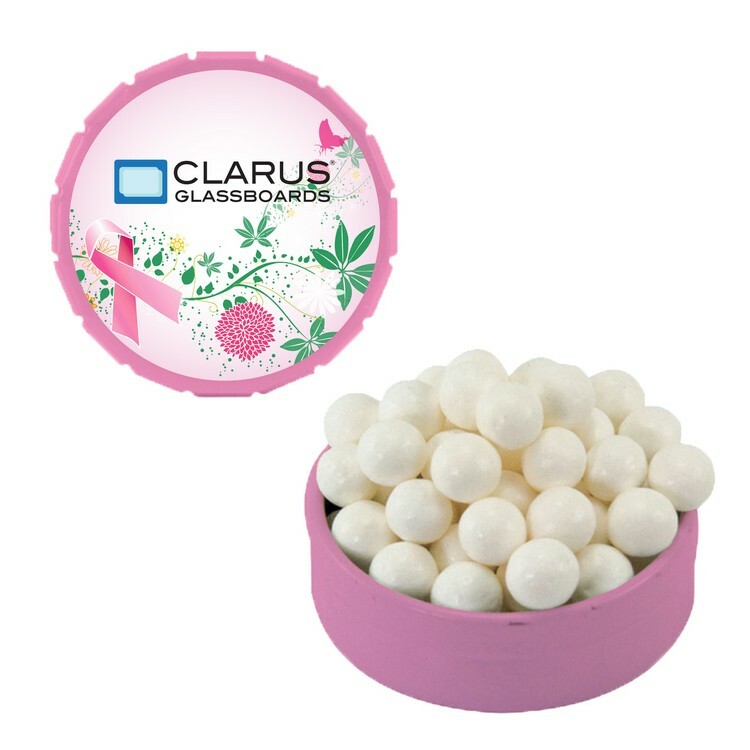 Our clear acrylic full moon show piece is filled with candy hearts and is a great way to show your clients why your company is clearly the best. 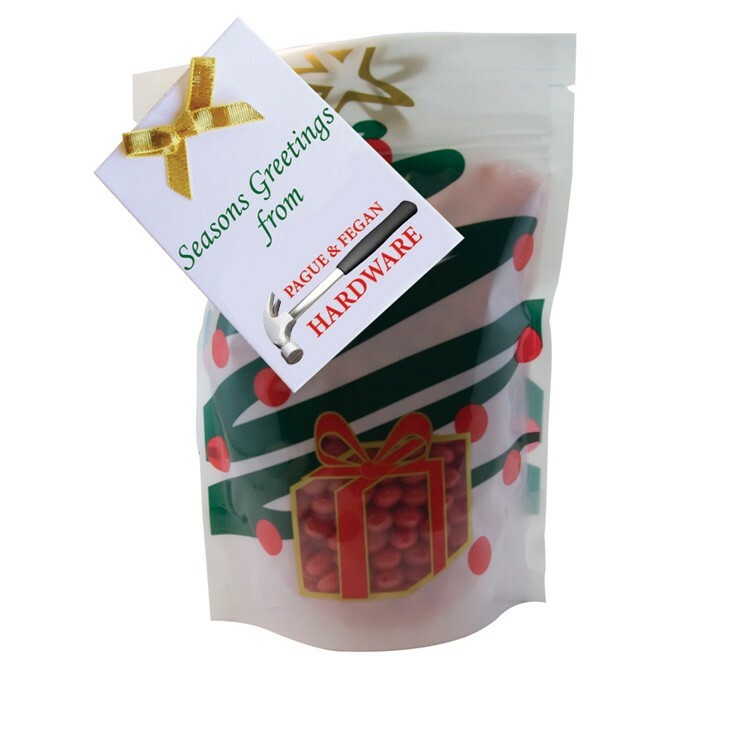 Can be filled with Signature Peppermints, Chickle Gum, Red Hots, Jelly Beans, Chocolate Littles, Corporate Color Candy, Sugar Free Gum, Sugar Free Mints, Candy Hearts, Corporate Color Chocolates, Corporate Color Jelly Beans. 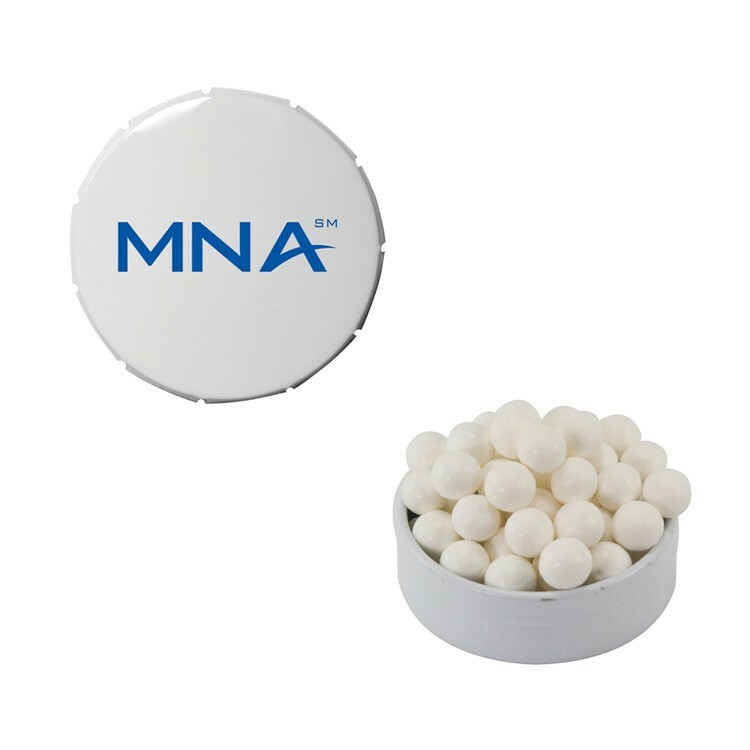 This Plastic Mint Dispenser is refillable and comes filled with Sugar-Free Mints. Printed with a 4-color process laminated decal or a 1-color direct imprint. 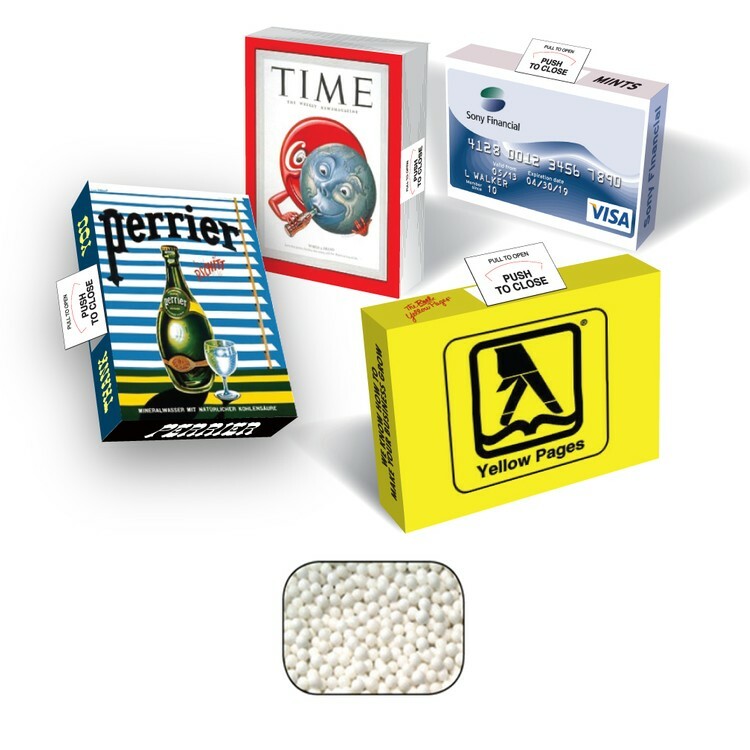 Great for tradeshows, sales person leave-behinds, and new product introductions. Other fills: Signature Mints, Sugar-Free Gum, Colored Candy, Cinnamon Red Hots, Jelly Beans, or Gum. Filled with Signature Peppermints, this upscale hinged tin is printed with a laminated 4-color process decal or a 1-color direct imprint. Can be filled with: Colored Candy, Signature Peppermints, Cinnamon Red Hots, Jelly Beans, Gum, Chocolate Littles (M&M-type candy), Sugar-Free Mints, Candy Hearts, Candy Stars, or Sugar-Free Gum. The tin is made in China and the candy is made and filled in the USA. 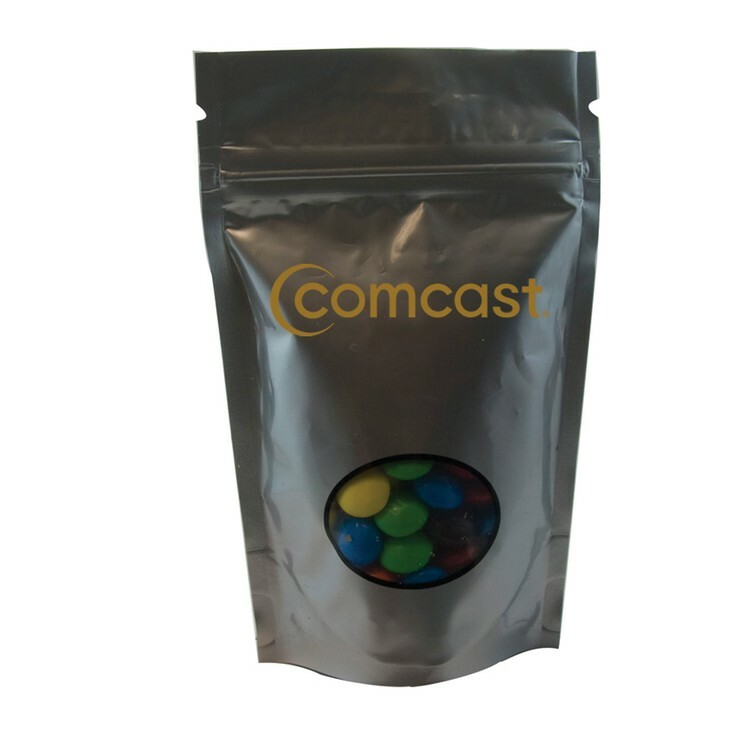 This recloseable window bag is filled with M&Ms and comes with a 1-color hot stamp of your logo or a full-color gift card with a gold bow. An elegant way to show your clients you care, and perfect for the holiday season. Available in multiple colors and designs. 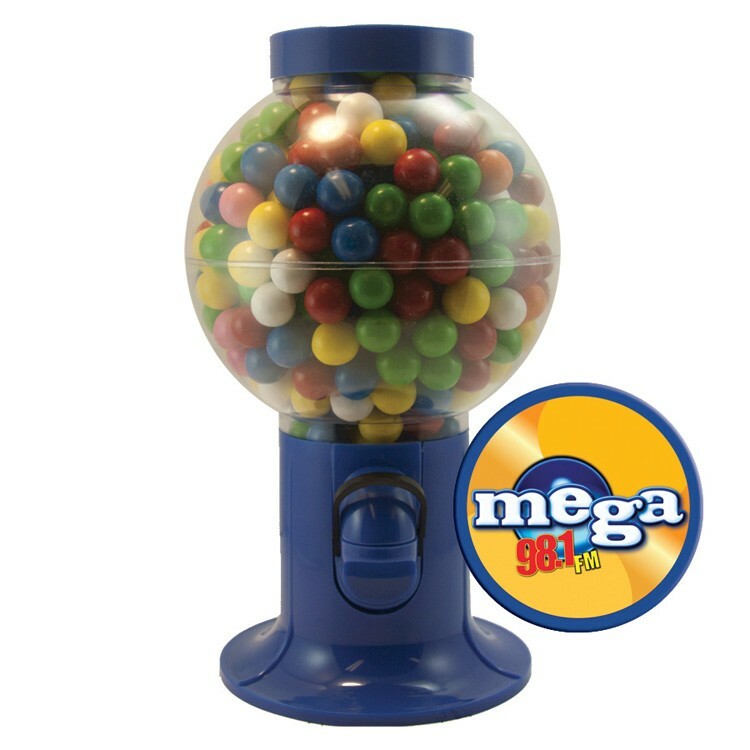 Can be filled with a variety of candy, chocolates, nuts, or pretzels – see pricing. All window bags are hot stamped with Gold or Silver only. This Plastic Mint Dispenser is refillable and comes filled with Jelly Beans. Printed with a 4-color process laminated decal or a 1-color direct imprint. Great for tradeshows, sales person leave-behinds, and new product introductions. Other fills: Signature Mints, Sugar-Free Gum, Sugar-Free Mints, Colored Candy, Cinnamon Red Hots, or Gum. Our 4 oz. Mug Stuffers are the perfect touch! Available styles are Gold Dots, Red Swirl, Black Diamonds, or Clear. Each Mug Stuffer is filled with Colored Candy, and comes decorated with a 4-color process laminated decal on the front. Other fills: Cinnamon Red Hots, Jelly Beans, Gum, Peanuts, Skittles, M&M's, Chocolate Littles, Candy Hearts & Stars, Animal Crackers, Starlite Mints, Corporate Color Program, Chocolate Covered Espresso Beans, Pistachios, or Cashews. 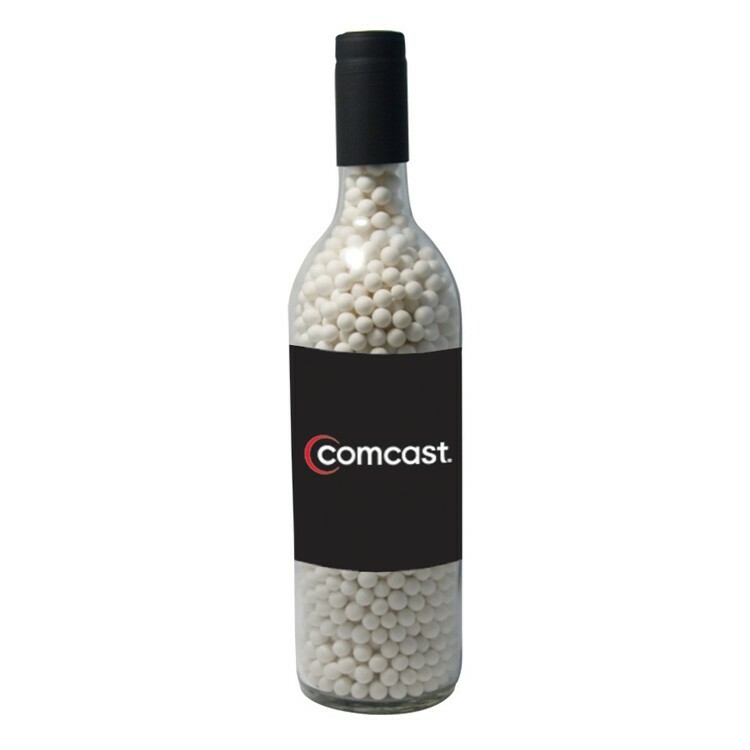 Our wine bottle filled with Gum is a fantastic way to say "Thank You”. 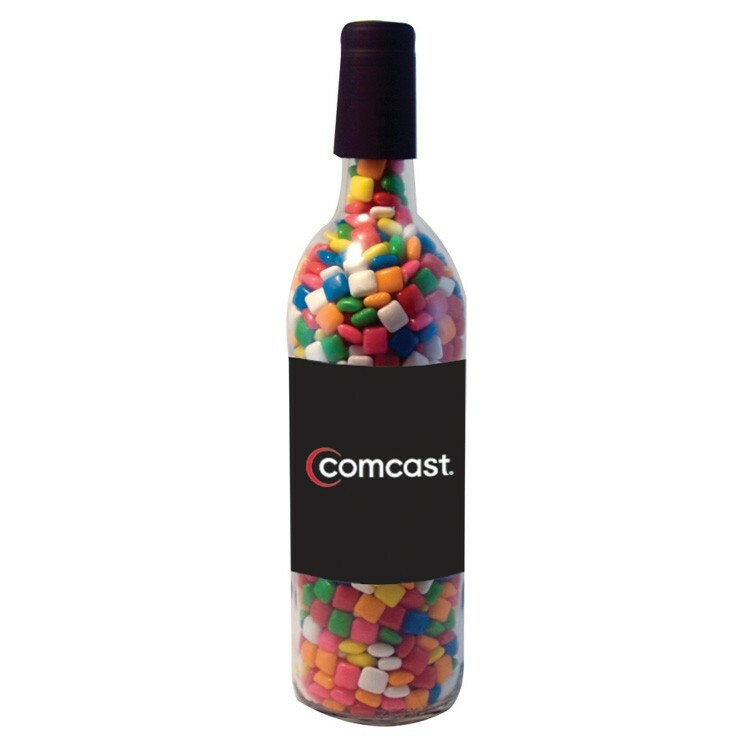 Each one is hand filled, sealed with an authentic wine band, and printed with a 4-color process laminated decal. Other fills: Signature Peppermints, Cinnamon Red Hots, Jelly Beans, Gum, Chocolate Littles (M&M-type candy), Corporate Color Chocolates, Corporate Color Jelly Beans. 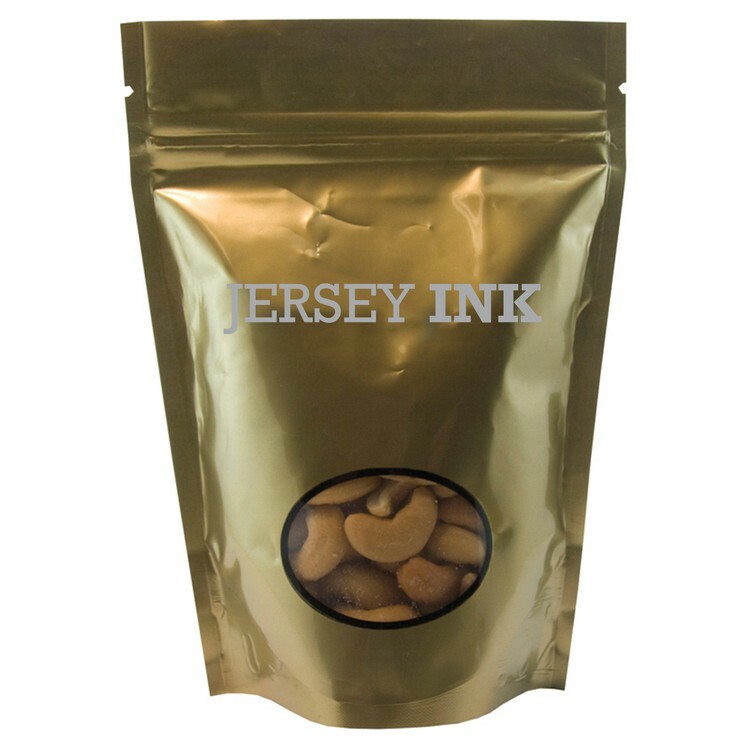 This recloseable window bag is filled with Cashews and comes with a 1-color hot stamp of your logo or a full-color gift card with a gold bow. An elegant way to show your clients you care, and perfect for the holiday season. Available in multiple colors. Can be filled with a variety of candy, chocolates, nuts, or pretzels – see pricing. All window bags are hot stamped with Gold or Silver only. 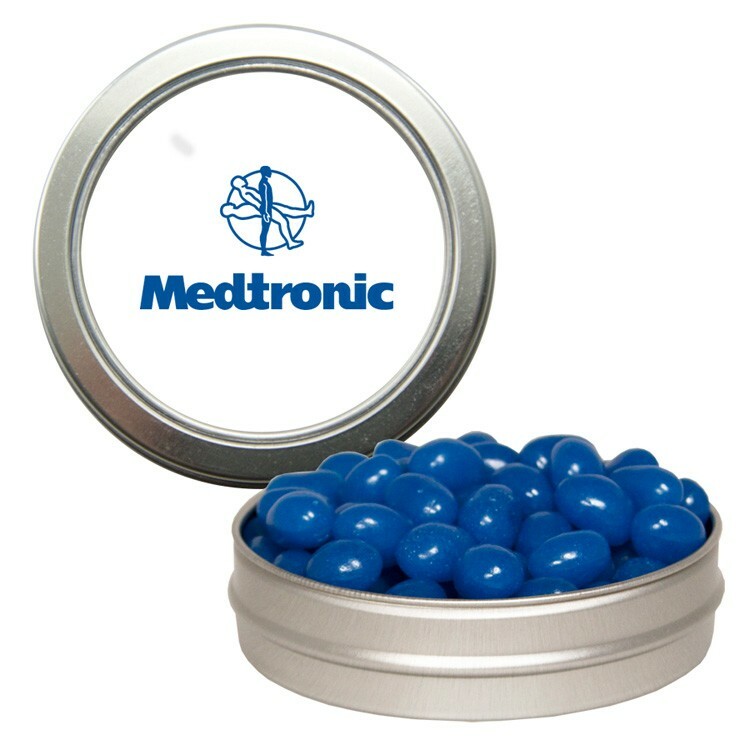 This slim see-through tin is filled with Corporate Color Jelly Beans and comes with a 1-color direct imprint. Tin color is silver. 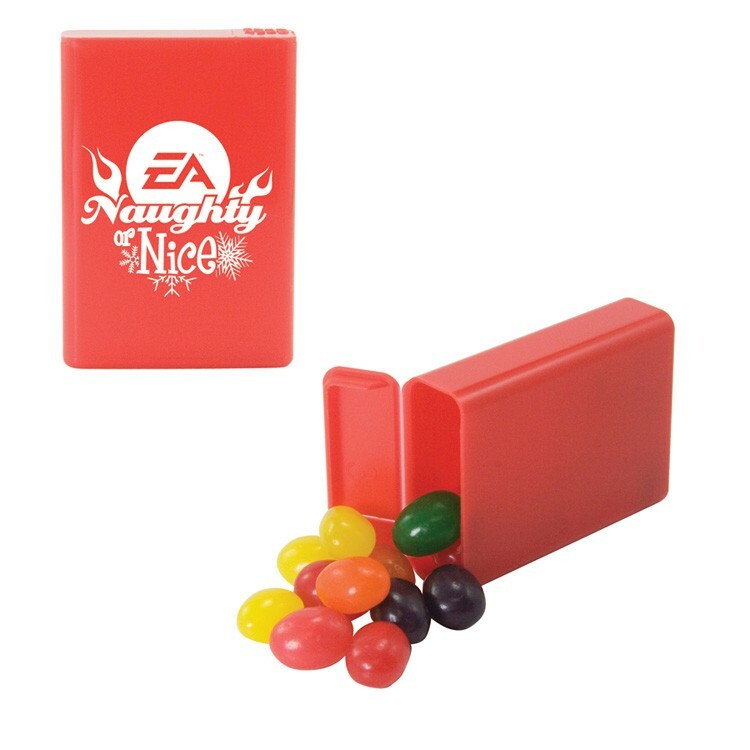 Can be filled with a variety of candies and nuts. 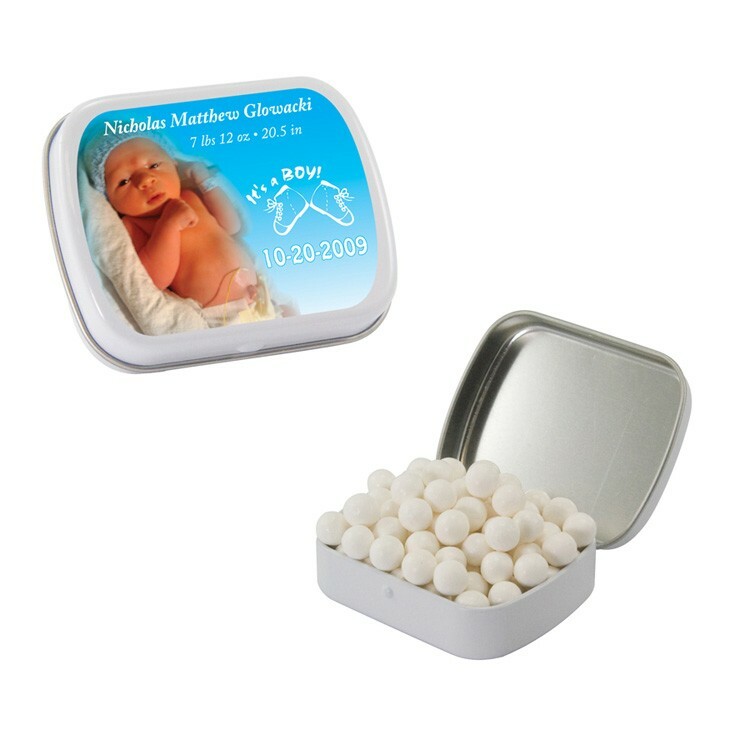 Can be filled with Signature Peppermints, Gum, Red Hots, Jelly Beans, Peanuts, Sugar Free Peppermints, Candy Stars, Candy Hearts, Sugar Free Gum, Colored Candy, Chocolate Littles, Mini Tarts, Corporate Color Chocolates, Corporate Color Jelly Beans. The tin is made in China and the candy is made and filled in the USA. 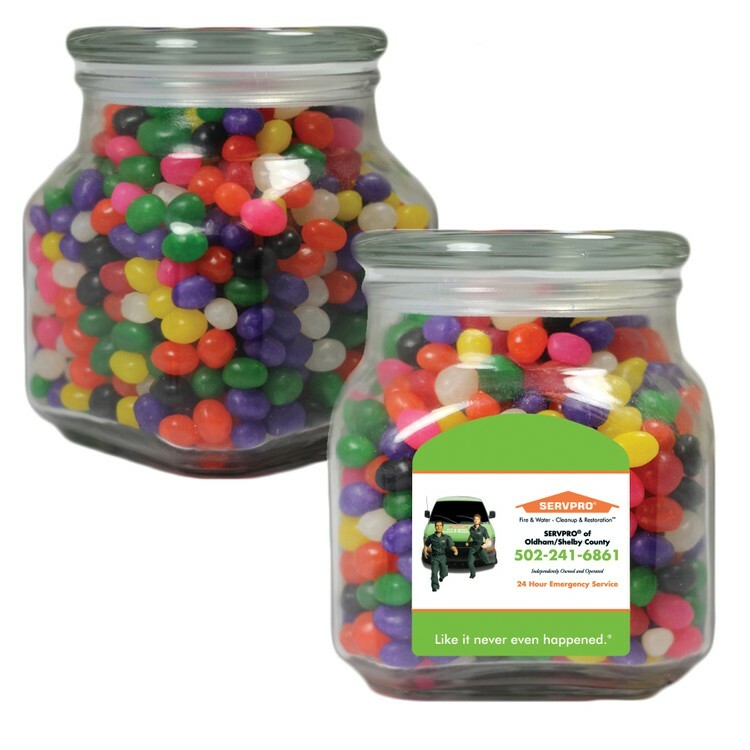 This large glass Apothecary Jar comes filled with jelly beans and is printed with a laminated 4-color process decal or a 1-color direct imprint. Other fills: Chocolate Littles (M&M-type candy), Cinnamon Red Hots, Jelly Beans, Gum, Pistachios, Peanuts, Candy Hearts, Candy Stars, Corporate Color Chocolates, Corporate Color Jelly Beans, Starlite Mints, Signature Peppermints, Chocolate Balls, or Starlite Mints. This recloseable window bag is filled with Cinnamon Red Hots and comes with a 1-color hot stamp of your logo or a full-color gift card with a gold bow. An elegant way to show your clients you care, and perfect for the holiday season. Available in multiple colors and designs. Can be filled with a variety of candy, chocolates, nuts, or pretzels – see pricing. All window bags are hot stamped with Gold or Silver only.